In a couple of weeks, the Fall issue of ANS, Vol 39 No 3 will be released! 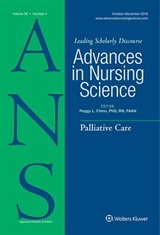 This is our first issue that features articles on a wide range of topics, while maintaining the ANS tradition of articles that lead cutting-edge discourses on issues of critical importance for nursing and healthcare. Here is a preview of the Table of Contents! Teen Mothers’ experience of Intimate Partner Violence; a metasynthesis.